Charles Phoenix has cooked up one loaded dessert. Charles Phoenix presents the Cherpumple. You're still reeling over the Charles Phoenix Astro-Weenie Tree, we're betting. We are. We'll probably never get over our reeling. Because. A giant foil-covered cone, which is then covered in little toothpicked pickles and veges and whatnot. Now the bon vivant and wisecracking, LA-lovin' historian has fashioned a new dish just in time for the holidays. It is the Cherpumple. Say that 20 times fast. What IS a Cherpumple? Although it sounds like a creature out of Lewis Carroll, it is actually, according to Mr. Phoenix, the dessert version of the turducken. You know the turducken. Chicken stuffed in duck stuffed in turkey, and then cooked. The Cherpumple is a spice cake, in which an apple pie is baked, then there's a yellow cake layer in which a pumpkin pie goes in, and the cherry pie goes in the top level, which is white cake. Phew. Even saying it all in one go takes a push. 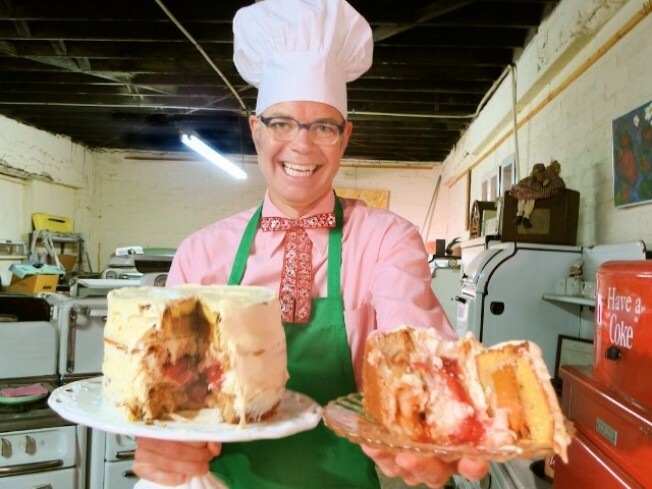 Mr. Phoenix has a full video on how the Cherpumple comes together. If you're looking for the perfect, they're-sure-to-remember-it-for-Christmases-to-come sweet to show at the big party with, check it out now.